Come for the fun. Stay for the education. 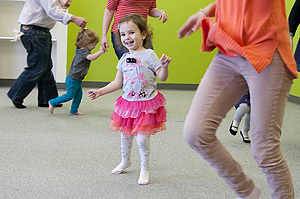 Children and adults alike enjoy singing, dancing, moving, and playing together musically in our active, engaging classes for babies, toddlers, and preschoolers in Lincoln, Nebraska. What's a class like? 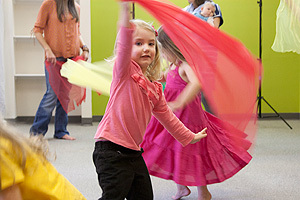 Singing (with real, live voices), rocking, dancing, playing instruments, echoing tonal and rhythmic patterns, and purposeful listening--all are a part of a Musikgarten class. Music nurtures all aspects of human development: intellectual, emotional, physical, and social, in an environment that fosters friendships and community. The result? 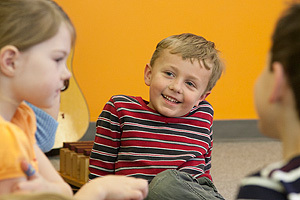 Infants, toddlers, and young children--adults, too!--develop a deep love of music and the ability to express it. View our classes and meet the teacher. Then, register for class and join us!